Regular readers of Midwest Guest know that this blog reached its first year anniversary on the first of August, just as I returned from the big BlogHer and TBEX conventions in Chicago. So, I decided to wait until now to have a little celebration! Folks who went to BlogHer know that we got bags and bags of swag. I brought home a lot of nice kid- and parent-oriented swag, but not having kids, I decided to pass some of it on. This is my first giveaway, so I'll to try to keep it simple. 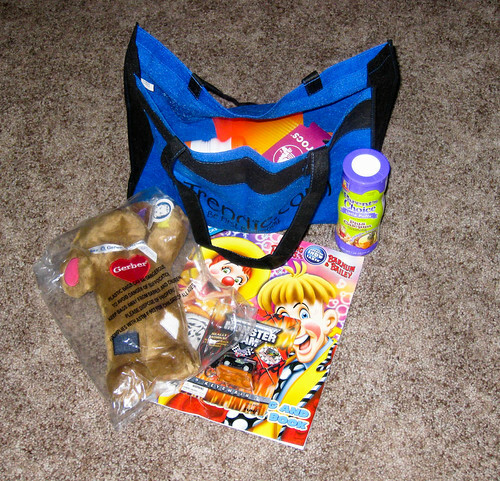 I've got two swag bags with mostly toys for younger kids--check out the photos for a peek at the bags and some of their contents. Think of it as a semi-mystery grab bag prize. I'm opening this up to U.S. residents who leave a comment on this post by 11:59 p.m. (Eastern Standard Daylight Savings Time) on Monday, September 14. We'll pick two names randomly, and each name picked will get one of the swag bags. Only one entry per person, and Midwest Guest reserves the right to eliminate entries that are rude or spam comments. Don't have kids? Didn't win one of these two swag bags? Don't worry, I'll have another small giveaway prize later this month that should have pretty universal appeal. The top 14 things likely to happen to you on vacation: a guide for solo travelers and others-Ellen at Boldly Go Solo takes on the abomination known as a "staycation" and offers a handy-dandy guide to determining if you're really on vacation, or simply staying home. Driving backroads beats the tar out of the Interstate-The always entertaining Sheila talks about the joys of jumping off of the expressway to travel the lesser-traveled backroads at Family Travel Guide. North Dakota's Old Red/Old Ten Scenic Byway-Linda jumps off of I-94 through North Dakota to explore a byway comprised of country roads and local city streets running through heart of some of her home state's small towns and beautiful countryside at Travels with Children. Born and Bred Chicago Girl Rediscovers her Roots-Read about Barbara's return to her hometown for BlogHer the TBEX convention and see some great photos as she rediscovers her Chicago roots at Hole in the Donut. The (Un) Windy City-Check out another take on Chicago as world traveler Matt shares his impressions of the city at Nomadic Matt's Travel Site. Best Things to see and do in Chicago-Send a bunch of travel bloggers to the same city for a convention, and you'll get plenty of great advice about visiting the city. Check out Nancy's suggestions for making the most of your Chicago trip at What a Trip. The Heidelberg Project: Polka Dots Over Blight-Regular Midwest Guest readers know I'm from metro Detroit, so I'll share something from a favorite Detroit-area blogger. Check my friend Becks at Detroit Moxie and read her take on artist Tyree Guyton's urban installation, the Heidelberg Project. Michigan, My Michigan-Michigan is my home, and I can empathize with this heart-felt take on why Michigan will always be home for Lannykidsmom at Four Now. Ice Cold Pop!-Yup, it's "pop" here in Michigan. Seeking Michigan looks at a couple of Detroit favorites when it comes to a cold drink on a hot summer day-Vernor's and Faygo. Origin and First Use of the word "Yooper"-Curious about who coined the term "Yooper" to describe residents in Michigan's Upper Peninsula? Just ask Bugsy Rocker at Yooper Steez. What the heck is "steez" you ask? Check out the blog for answers that and other burning questions about the UP. Family Travel in Ohio: the 50-state series-We're so close to the Ohio border that we end up spending a lot of time in that state, so I had plenty to say when Sheila asked for family-friendly travel suggestions to include in a post about that state at Family Travel Guide. Ely 2016!-The 2016 Summer Olympics come to Ely, Minnesota? You never know! Meanwhile, check out Ely's Dorothy Molter (a.k.a. the "Root Beer Lady") Museum at A Closer Look at Flyover Land. We visited here when we vacationed in the area many years ago--fascinating story and great root beer! Split Rock Lighthouse near Two Harbors, Minnesota-I love lighthouses, so I'll end with this post where Linda shares the story and some photos of one of my favorite Great Lakes lighthouses at Travels with Children. Anyone know of some great Midwest travel blogs and stories I may have missed? Thanks for the link love! You're doing great work. Congratulations on your 1st blog anniversary! I'm sure you'll have many more to follow. Thank you for including me in your link-love list. I'm honored. And I can't wait to go and read the other posts on the list. Excellent post. I especially like the posts on small towns and byways. When our family goes motorhoming we always try to get off those darn Interstates as much as possible. How nice of you to give away your extras. Looks like some fun kid stuff in the bags! And thanks for the mentions of my posts. I appreciate it. Thanks everyone! Which ones of you are in for the prizes? 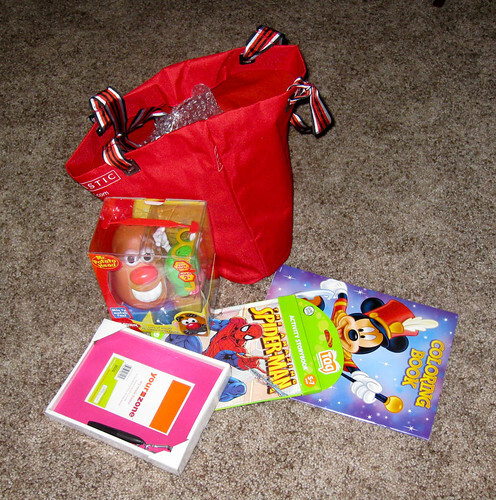 My little buddy Colton would love the Red Bag. I got to your blog from Detroit Moxie. I'll be checking back. Another Midwest travel site I found recently is Midwest Weekends: http://www.midwestweekends.com/ They even mention the Hermann the German celebration this coming weekend! Saw this on Twitter! Always good to have a few extra 'tricks' up one's sleeve. These would come in handy! Hi! Who can resist Mr. Potato Head? My kids are pretty toyless (due to our move to the midwest) until the end of October, so a surprise bag would sure brighten their day. Congrats to Beth and Tracyn!